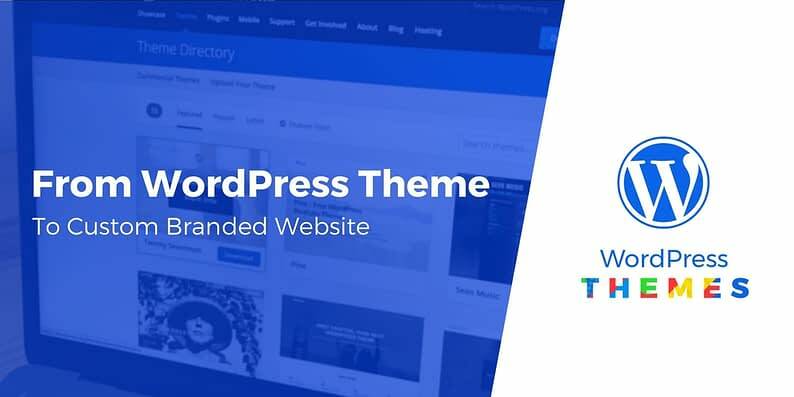 In some cases, getting a nice-looking WordPress theme is only the start of your journey to build a great, branded website that’s exactly what your business needs. Your goal, as a website owner and WordPress user is to get from theme to website as efficiently as possible. And, luckily, building a customized, focused, and engaging website that captures your brand is something that’s within anyone’s reach, even when starting with a largely pre-designed theme. In this article, we’ll explore tips for creating distinctive and well-branded websites from WordPress themes. As in, this is your path from WordPress theme that you’ve just chosen to a working website. Most readers come away from their reading not with a clear, precise, detailed registration of its contents on their minds, but rather with a vague, misty idea which was formed as much by the pace, the proportions, the music of the writings as by the literal words themselves. This is what website branding is truly all about – effectively creating an underlying feeling that the visitor will carry away with them and will inspire them to act in the future. While branding a WordPress theme can be a little overwhelming at first, doing so is something that is certainly within your reach. By dividing the design process into multiple components, you can create the style of website that you are hoping for, and effectively project your desired brand image. The first step in this process, of course, is solidifying the brand that you’re trying to create. Start by making some big picture decisions: Do you want to convey a fun, pragmatic, modern, powerful, or high-end brand? Generally, most brands will fall into one or multiple of these high-level categories. The branding that will be most appropriate for your business will depend on the image you are hoping to create. Before making any major decisions, clearly define the purpose of your company, the desired use of your website, and your specific target market. Each of these factors should guide you throughout the decision-making process. Once you are able to clearly identify the underlying brand, creating a website that projects such an image will be much easier. If your answer is – My customer wants a white-glove solution from a highly-skilled expert, then move towards a high-end branding style. If your answer is: My customer wants to lose weight and feel empowered, then create a powerful brand that will connect deeply and emotionally. And if you answer: We sell cheap widgets, then go with a simple, pragmatic brand image. Take some time to explore your favorite websites and start to deconstruct them. As you browse different sites, think of them as themes, and imagine yourself plugging different images and unique content in them. If you explore the WordPress theme Hestia, you will see a very functional design that can easily be branded in a myriad ways. Despite the simplicity of this theme, with just four changes (background, headline font, headline color, and button color) we’ve created a completely different look and feel. The importance of colors and fonts is something that is often overlooked. While a simple white background can project an image of seriousness, a sleek black background might be a better choice for an innovative company in the tech industry. Look back at the websites for Superhero Teacher Toolkit and Owner Media Group (in Step 1). You will notice that they have a very similar color palette. However, the muted tones of Superhero Teacher Toolkit has a much different effect than the vibrant tones of Owners Media Group. Similarly, your choice in font presents an opportunity for you to either project a traditional (Calibri, Times New Roman, etc.) or casual (Papyrus, Poor Richard, etc.) style of doing business. When designing your website, don’t be afraid to test different color and font options. You’ll never know what you like best until you’ve seen several variations. Images are a great way to brand a WordPress theme. A consistent style within the images you choose will go a long way in developing a custom branded site. Custom art such as the above used by WPMUDEV can go a long way in transforming a WordPress template into a custom branded website. While outside of most companies budget, creating a high-end custom style of art for your website, as Angry Birds has done, is a great way to develop a completely unique brand using a WordPress theme. A photo shoot is another way to inject custom elements into your theme. Adam Rosante‘s WordPress website excellently illustrates the power of a custom photo shoot. Quality, simple photos of Adam have made this standard site completely unique. If you are using a more general branding strategy, stock photos can suffice in creating a unique brand. However, you must ensure that all of the stock photos have a similar style. Try not to mix bright with dark photo, people focus with object focused photos, or real images with clip-art style photos. When searching for stock photos you have a lot of options. Find great free stock photos at sites like MyStock and Pexels. For paid stock photos you might explore iStock Photo or Adobe. You can even find premium stock photos at sites such as Shutterstock’s OffSet.com. As you can see – whether photos or custom art – images are a great way to transform a standard template into a custom branded website. Your logo is a very valuable component of your overall brand image. 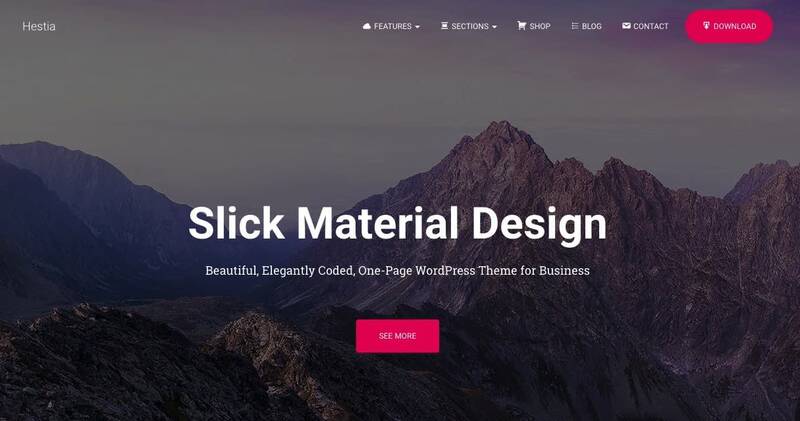 Use your logo as a key component of branding your WordPress theme. 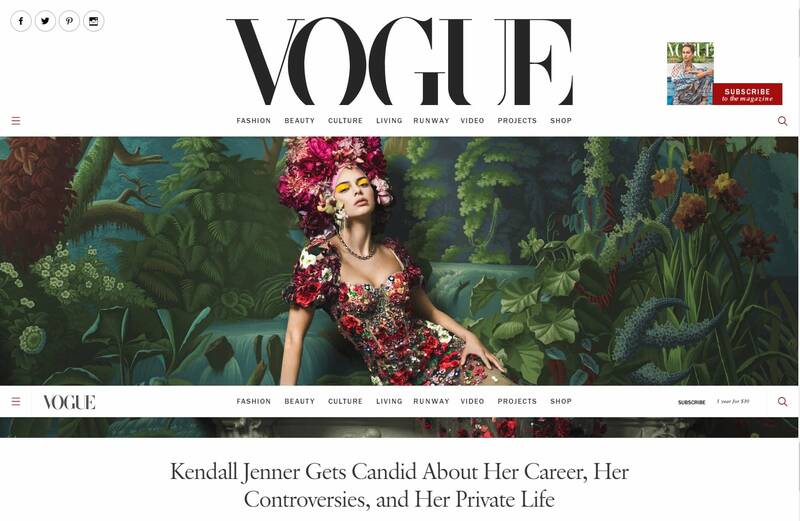 Vogue is an excellent example of a WordPress site in which the logo is a key element and a great brand asset. Also, you can see how the official Bond website has used their logo (and images) to completely transform an otherwise very standard and unremarkable website. When choosing your theme, pay specific attention to the placement of the logo or your ability to change that placement. The majority of logos are in the upper left of a website. Sometimes the placement is very close to other header elements like navigation links. Other times a logo will have a lot of “white” space around it. Using a theme that places the logo in the center of your site will allow you to draw attention to this branding element. Also, when building a WordPress website, never forget to use your logo as the favicon. This is a crucial step in developing a professional website and securing your brand image. Since the development of WordPress 4.3, you can now add a favicon or site icon from WordPress admin area. To do this, simply go to Appearance → Customize and click on the ‘Site Identity’ tab. The site identity section in the Customizer allows you to change the site title, description, and control whether or not you want to display them in the header. It also allows you to upload your site icon. Simply click on the select file button and then upload the image you want to use as site icon. When you build from a template using key branding elements like font, colors, images, and logo, you can create something genuine and special. 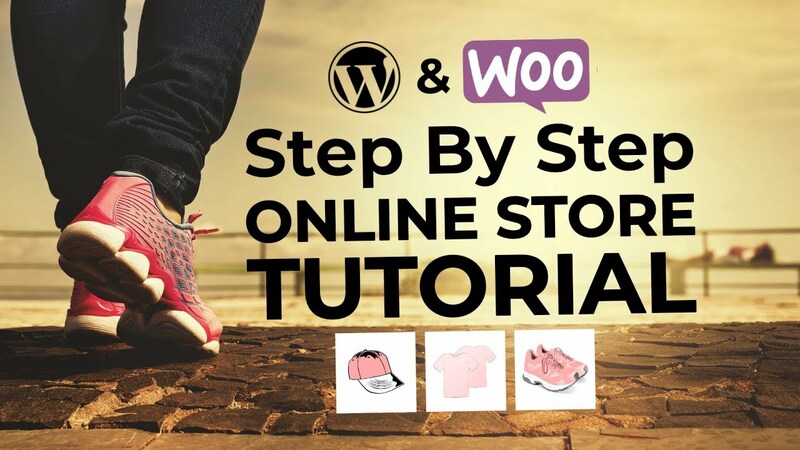 By following these straightforward steps, you can rapidly transform a WordPress template into a custom branded website. Is there anything that causes you problems when turning a WordPress theme into a final website? Let us know in the comments. About the author: Grant Polachek is the Director of Marketing at Squadhelp.com, helping entrepreneurs and marketers find great business name ideas and create strong brands. Through a disruptive crowdsourcing process, Squadhelp connects you with the most creative people across the globe.